The long-awaited companion movie to Disney's Cars and Cars 2 is almost here! 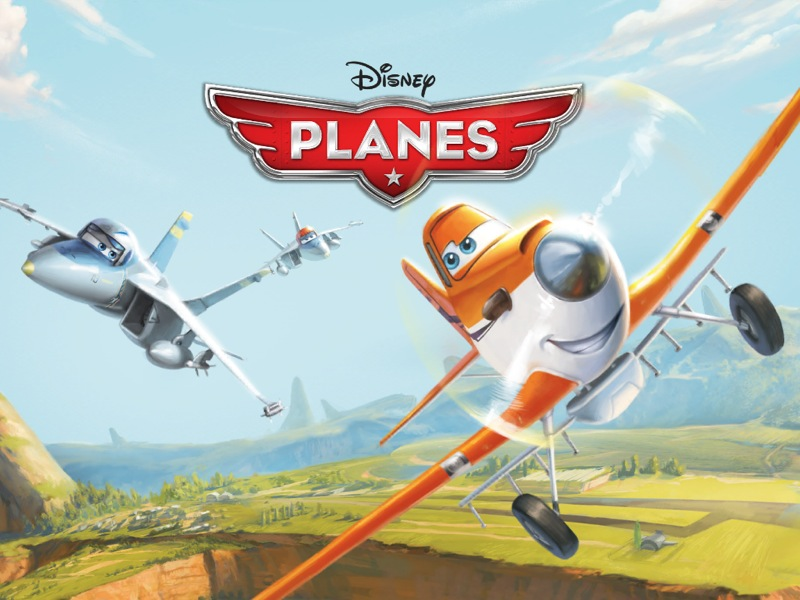 Disney's Planes is flying into theaters, and it's going to be great. The kids and I saw an advanced screening of the movie two nights ago, so we know your kids are going to love it! They will love it so much that they'll probably be pleading for Dusty tshirts, model airplanes, coloring books and storybooks. Fortunately (okay, luck had nothing to do with it and Disney product development had everything to do with it), young Planes fans will be able to get their fill of Planes even after they watch the movie, with the release of Disney's Planes: Storybook Deluxe app. It's part storybook, part game play, part card collecting, and all fun. 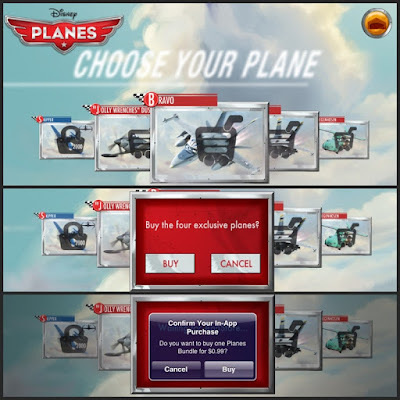 It has so much functionality built in, it's well worth the price for young Disney fans in general and young Planes fans in particular. 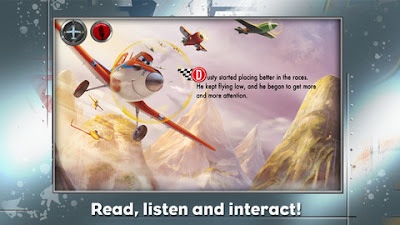 This is the storybook portion of the app that takes readers through the story of Planes. Like all of Disney's Storybook Deluxe apps, older kids can read the story on their own, and younger ones can listen to a narration or a recording of their favorite grownup reading the story. And like all of Disney's Storybook Deluxe apps, this one does a great job of bringing the story alive through film clips, music, and animated art. A new feature to this particular storybook is the way the app games are woven into the story. At certain points in the story, readers are taken into Race and Fly mode, where they can take the controls behind Dusty (or any other character they've already unlocked) and go on some test runs. While I love the games (see the next section, Race and Fly), I'm not sure I like having to interrupt the story to play a game. Not to worry -- if you or your child feels like me, you can always opt out of the game and return to the story. 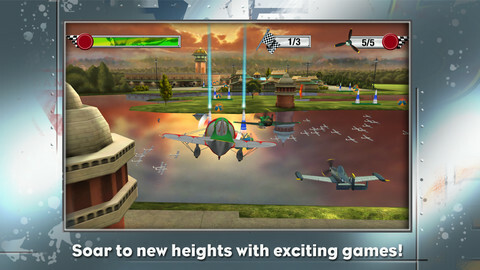 The Race and Fly section lets kids race Dusty and other Planes characters through the use of tilt-and-play technology. There are a total of 16 games -- a combination of time trials, races, and practice course runs with varying levels of difficulty. When you complete a game successfully, you earn a Jolly Wrenches badge (the skull and crossed wrenches icon that actually plays a big role in the movie). 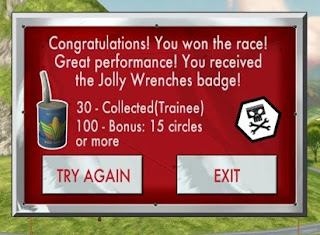 Collect as many of these badges as you can, because you'll need them to unlock the more challenging games. Initially, you'll only be able to play the games as Dusty Crophopper, but the more you play, the more characters you can unlock. As you work through a game, you'll see flying oil cans that you can collect. You can use these oil cans to unlock more characters to fly with in the game. There are a total of 14 characters to unlock. Ten of them -- Dusty, Ripslinger, El Chu, Ishani, Supercharged Dusty, Racing Dusty, Ned, Zed, Bulldog and Skipper -- can be unlocked by "spending" your oil cans (some characters require more oil cans to unlock than others). 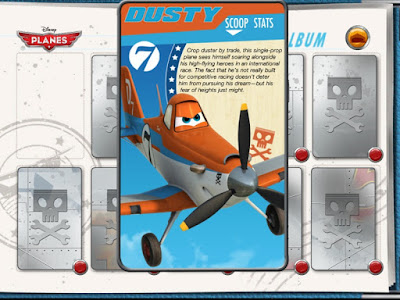 The final 4 characters -- "Jolly Wrenches" Dusty, Bravo, Echo and Liegenhosen -- can be unlocked by purchasing the Planes Read-Along Storybook and CD Bundle (available exclusively at The Disney Store and Disney Parks) and download the app using the code found on your storybook's inside cover. 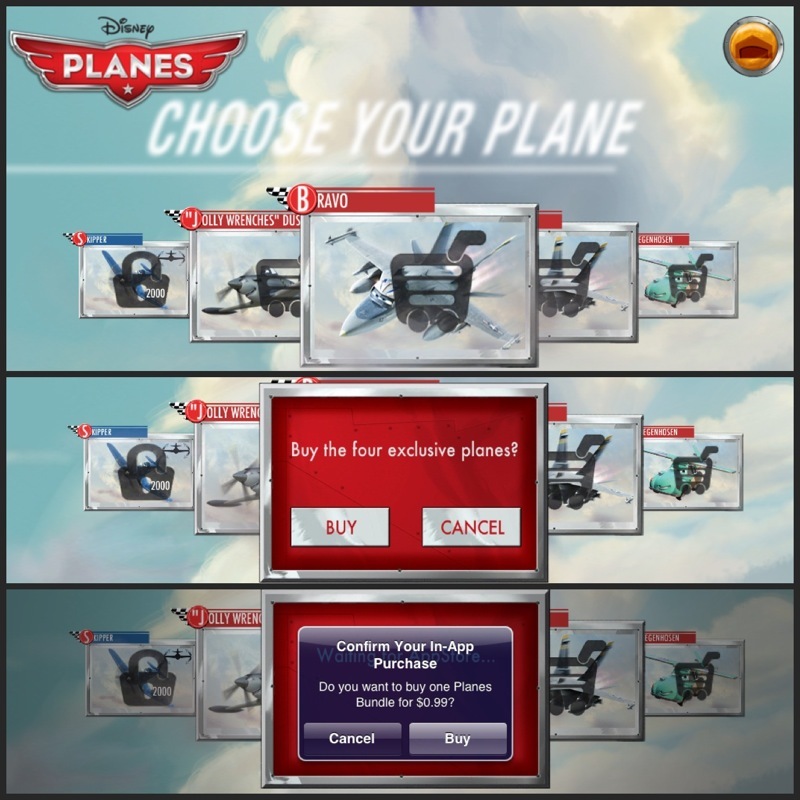 If you don't have the Planes Read-Along Storybook, you can also purchase the 4 bonus planes via in-app purchase for 99 cents (I ended up purchasing them because one of my kids is absolutely mad about Bravo). I give this games section a big thumbs-up. I've really been enjoying the games in the newer Storybook Deluxe apps -- notably Brave, Monsters University, Cars 2, Wreck-It Ralph, and now Planes -- because each one is unique, each one is themed to the story, and each one is challenging and fun to play. No more boring puzzles or coloring apps! 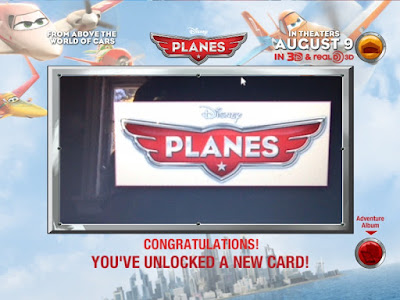 Kids can collect virtual Planes cards by holding their device up to any Planes logo (I did an image search and held our iPad up to my laptop screen). Image recognition software will scan the logo and unlock a new card every day! 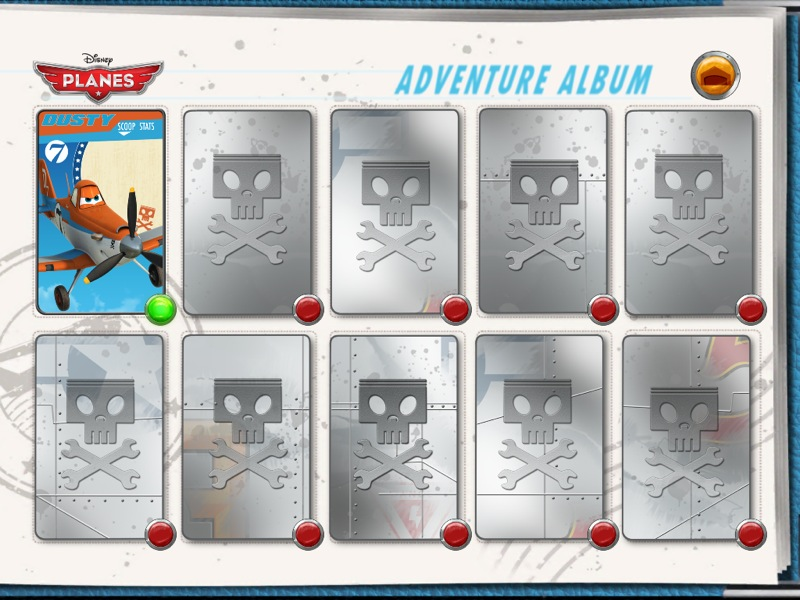 There are 10 cards to unlock and collect; they're displayed in the app's Adventure Album. Each character card has a description of the character as well as a list of stats (height, wingspan, etc..). I'm a big fan of the card-collecting features in the newer Storybook Deluxe apps because it lets kids learn more about their favorite characters -- plus, they're fun to collect (and collecting them doesn't cost anything!). You can download Planes: Storybook Deluxe from the App Store for $6.99, or purchase the Planes Read-Along Storybook and CD Bundle (available exclusively at The Disney Store and Disney Parks) and receive a code to download the app (plus the 4 special planes I mentioned before) for free! The app is compatible with the iPhone, iPad and iPod touch. Disclosure: I received a sample code to download and review the app. The views and opinions expressed here are my own. AG San Francisco is still under construction but will be opening in a few months. I took this photo in early July. It looks like American Girl's newest store -- at the Stanford Shopping Center in Palo Alto, CA -- is progressing nicely towards its scheduled Fall 2013 opening! I'm keeping close watch on the store because it's just 5 minutes away from my home. This will be only the 3rd American Girl store on the West Coast so I'm sure there are millions of other happy girls and their parents (however expensive a trip to the store can be, it's infinitely more expensive when you have to pay for flights and a hotel!) who are anxiously awaiting the opening. 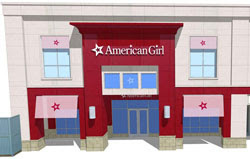 The store will be called American Girl San Francisco (even though the actual store is at the Stanford Shopping Center in Palo Alto, which is about 40 miles south of SF). 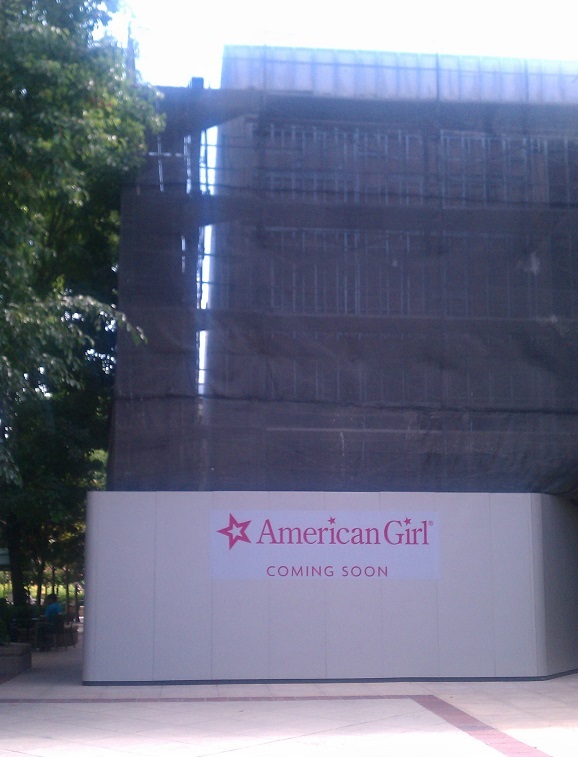 As an American Girl doll fan, I'm just as excited about the new store as all those little girls! Our school year is just around the corner; in just two weeks, we'll be back to our usual crazy schedule. With three kids in two schools, I've got to deal with all sorts drop-off times, pick-up times, afterschool schedules, carpools and more. Now that The Pea is in middle school, I give her a lot more freedom to come and go -- but since her schedule varies so much from her brothers' schedules, she often finds herself arriving at home when I'm halfway across town. Like most families, we keep a spare set of keys so she can let herself in, and so Alfie and I can let ourselves in on the occasions that we leave the keys in the house and lock ourselves out. I recognize the necessity of having those keys, but I'm well aware of the security risk. I know many people who actually do leave their keys under the doormat, under a flowerpot, in the mailbox (and a few that leave their door unlocked! ), but we like to take better precautions. If you have a latchkey kid like mine, a key safe is a great solution for giving her a secure way to get into the house. Your child doesn't have to carry house keys around in his or her backpack, where they can easily get lost; he or she can let themselves into their home by taking the spare key out of the key safe. All your child has to do is remember the combination to the key safe. One lucky Bonggamom Finds reader will win a WordLock Stor-More Key Safe. Leave a comment on this post and share a tip to keep your child safe after school when he or she is traveling home from school, or home alone after school. This giveaway ends at 11:59PM PST on August 20, 2013; I will draw a winner at random on August 21 and post their name after they confirm acceptance. Continental US residents only. For additional giveaway rules, click here. Disclosure: As a member of the WordLock Parenting Council, I received product samples to review and give away. The views and opinions expressed here are my own. 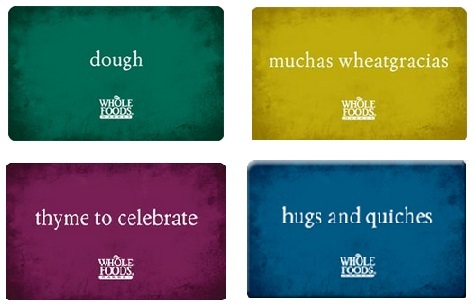 I've loved Whole Foods Market gift cards from the moment I first saw them on the checkout stands. They're pretty and witty -- Dough! Just for the halibut! Muchas Wheatgracias! Thyme to celebrate! Hugs and quiches! Happy birthday tofu! Soy to the world! Peas on earth! To all a good bite! -- and they are the perfect way to celebrate food and friends. Speaking of celebrating, that's just what one lucky Bonggamom Finds reader will be able to do with the $20 Whole Foods Market gift card that I'm giving away today! Whole Foods has given me a $20 gift card for one winner to try out something from Whole Foods, whether it's a savory snack like artisanal vegan cheese, a tasty treat decadent summer fruit dessert, or a pantry staple like (my new favorite legume!) organic red lentils. Leave a comment on this page and tell me what you would buy with $20 at Whole Foods. 7) Leave a comment on my Whole Foods artisanal vegan cheese post (1 entry). 8) Leave a comment on my Whole Foods summer desserts post (1 entry). This giveaway ends at 11:59PM PST on August 12, 2013; I will draw a winner at random on August 13 and post their name after they confirm acceptance. Continental US residents only. For additional giveaway rules, click here. Disclosure: Thanks to Whole Foods for providing the gift card giveaway prize. The views and opinions expressed here are my own. I've always said that I adopting a vegetarian lifestyle wouldn't be that difficult for me -- but adopting a vegan lifestyle would be impossible, because I cannot live without cheese. I've seen vegan cheese at the supermarket but they all look like rubbery sliced processed cheese. In other words, they don't look like cheese at all. So when Whole Foods Market invited me to try samples of the new nut milk cheeses they've begun to carry, why would I even bother? Because Whole Foods is stocking these cheeses in their cheese department. You know, the counter inside the store where they carry all their good cheese. Where they carry all their imported cheese. Their locally-made cheese. Their gourmet cheese. Their artisanal cheese. And believe me, Kite Hill cheeses are as artisanal as they come. 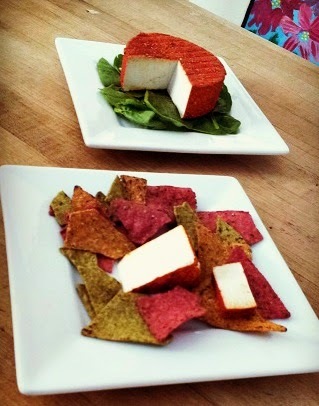 In fact, Kite Hill cheese is the first non-dairy cheese to be featured exclusively in Whole Foods' cheese department. They use only four ingredients: nut milk, cultures, enzymes and salt. Their nut milk is from almond farms in the San Joaquin Valley and is custom blended for each cheese. They use traditional French cheese-making equipment and mold their cheeses by hand. 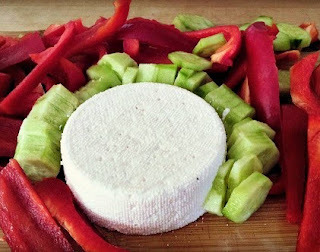 The result is soft cheese that's not just for vegans. It's cheese for anyone who loves cheese. Whole Foods sent me three varieties of Kite Hill cheeses, and after tasting them I definitely agree they deserve their place with the gourmet cheeses. I can't say I'm tempted to give up milk-based cheese and switch entirely to vegan cheese, but Kite Hill has definitely expanded my cheese palate and given me a whole new set of cheeses to serve and enjoy. Like most gourmet soft cheeses, they have a unique and distinct taste that "safe" eaters may wrinkle their nose at -- but it's a taste that adventurous eaters and cheese lovers generally enjoy! Out of the three cheeses we tried, the White Alder looks, feels and tastes the most like "real" (i.e. milk-based) cheese. It's also the strongest of the three, with a pungent aroma that reminds me of Taleggio or very stinky Brie. If your tastes run towards mild cheddar, I would leave this one for last and gradually work your way up to it. I can easily imagine children looking at the brownish, wrinkled rind and saying, Ewwww. Fortunately my kids will try practically any cheese on earth, and this one was no different, but they didn't really like the taste. To be honest, it wasn't my favorite either, but I can understand why people would like it. Oh well, to each his own. 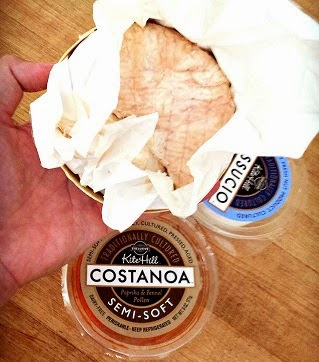 I liked the Costanoa cheese much, much better. It's a semi soft dusted with a piquant blend of paprika and fennel pollen. The cheese itself is mild, like the Casuccio (which I'll be talking about after this one), but the paprika and fennel give it a very pungent, almost sour, taste. Doesn't the red crust make it look beautiful? This cheese is fairly firm; the texture is similar to extra-firm tofu. It tastes wonderful with tortilla chips or on crackers drizzled with honey! The Casuccio is my favorite of the trio. 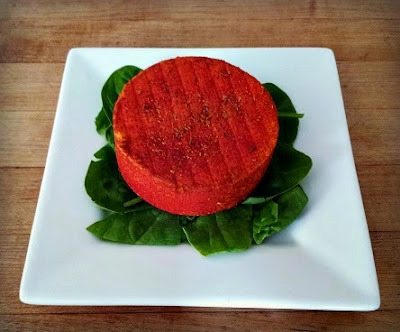 The texture might seem strange to anyone not used to vegan cheese -- the texture is very similar to tofu (in fact, when you slice it up, it looks just like tofu). One of my kids thought it was a strange kind of tofu. He didn't really care for it, but my other two couldn't get enough of it. 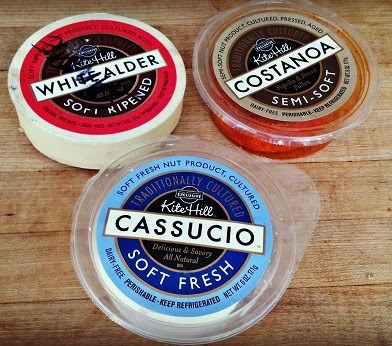 The Cassucio would make a great substitute for cream cheese, which cheese snobs hardly even consider proper cheese -- but unlike cream cheese, the Casuccio has a yummy salty-sour taste to liven up its mild taste. It goes really well spread on crackers, or paired with veggies, fruit and nuts. 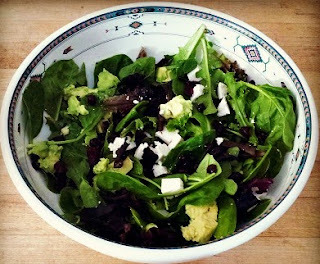 We used the last of our Cassucio in a mixed green salad with dried cranberries and avocado. It was mild enough so it didn't overpower any of the other flavors, but combined with the avocado it made the salad such a wonderful tanginess/saltiness/creaminess that the salad didn't need any dressing at all, just a squirt of lemon juice and some ground pepper. It was delicious!! There's a fourth variety: Truffle, Dill & Chive Cassucio, which I haven't tried -- yet. Every time I stop by the Whole Foods cheese department it seems to be out of stock, which is always a good sign! I love truffle oil... I love dill & chive... I love Kite Hill Cassucio.... how could I not love this? I'll keep checking, and as soon as I get my hands on this variety I'll update this post! One final note: We ate all the cheese cold. I haven't tried melting any of these cheeses or using them in my cooking, so I have no idea what would happen to them. Kite Hill artisanal vegan cheeses are sold in the cheese section of Whole Foods. They cost about $13 or $14 for a 6-oz. round. They are definitely available in the Northern California region; if you're not from NorCal, check with your local Whole Foods.... and sit tight if they aren't. If you are vegan, they are worth the wait. 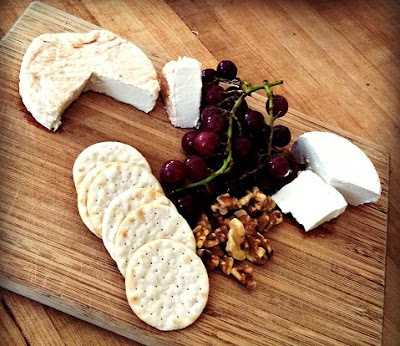 Disclosure: I received samples of Kite Hill cheeses for review. The views and opinions expressed here are my own. Vote for me in the Circle of Moms Top 25 contest! I have exciting news -- I'm in the running for the Circle of Moms Top 25 Northern California bloggers! The top 25 will be chosen on August 13, 2013 based on votes, so I'm asking, pleading with you all, dear readers, to help me out! I'd love you forever if you vote for me! * You don't have to register or log in to the site. * You can vote once every 24 hours until August 13. Making the Top 25 list would mean more opportunities to work with brands for great giveaways! And I'd love a nice shiny badge on my blog :) If you have a second, I'd pretty please with extra cheese love it if you could vote for me! Thanks in advance! This post was sponsored by Beau-coup Favors, Inc. 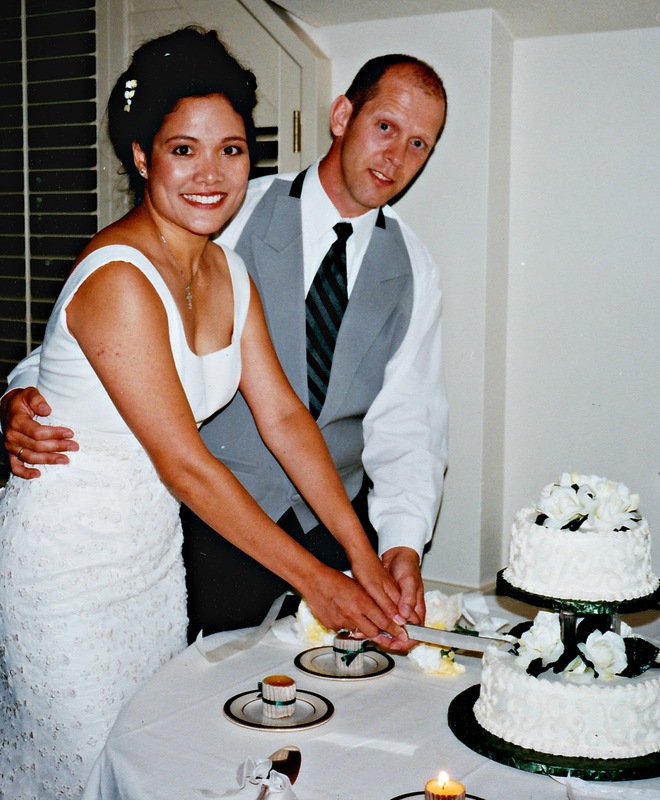 It was a lovely wedding, simple, small and intimate, with a focus on friends and family -- but gosh darn it, it was a lot of work! Even though I had plenty of time to plan the ceremony and reception, actually doing the planning and prep work was another story altogether. 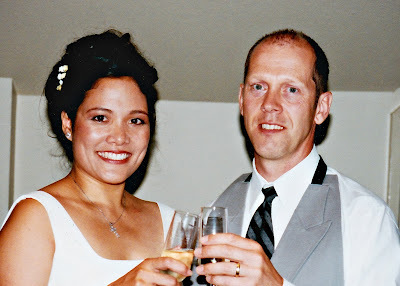 I was in my second year at business school, preparing for the birth of our first child and my move from Boston to California, while Alfie was neck deep in starting a company. We didn't have any close family to help out, so I was basically on my own. If only the internet had existed in its present form back then! I could have used online floral delivery websites or online wedding sites like Beau-coup Favors to help me with wedding invitations, place cards, thank-you cards, centerpieces and wedding favors. 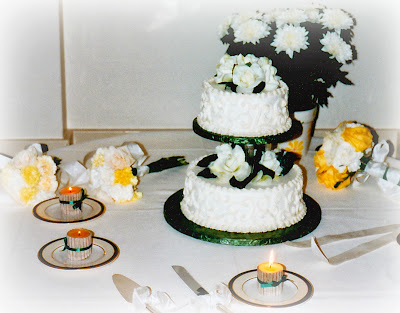 I could have had the loveliest favors and decor and it wouldn't have cost me any more than what I paid -- and believe me, I traipsed all around looking for good deals.... but the online options in 2000 were limited, so my searches involved cars instead of laptops :) Oh, well. At least when my daughter gets married, she'll be able to plan it all online. And you can bet I'll be doing the same when it comes time to plan our silver and golden wedding anniversary! I've teamed up with a group of bloggers to give away a laptop -- and not just any laptop, we're talking the Apple Macbook Pro! Giveaway ends July 29. The $15 Visa gift card in my Water Savers giveaway has now changed to a $20 Visa gift card giveaway! Enter by July 30. I'm sure you've got giveaways that are just as great or even greater than that, so free to leave links to your giveaways, both large and small. And don't forget to get cracking and enter everyone else's, too! Summer is just flying by! 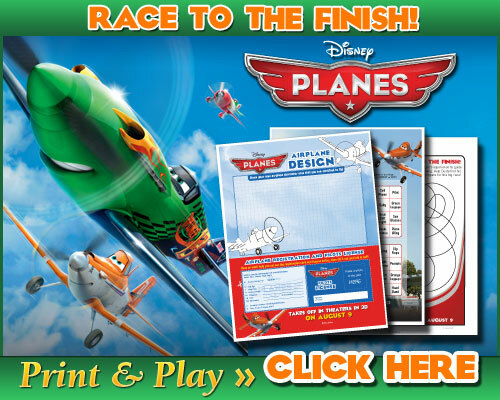 If you're running out of activities for your kids, check out these downloadable activity sheets from Disney's upcoming movie, Planes. Dusty has some fun activities to keep your family entertained while in the air, on the road or in your backyard, so click here to download the Disney Planes activity sheet. Have fun, and don't forget to watch the movie starting August 9! 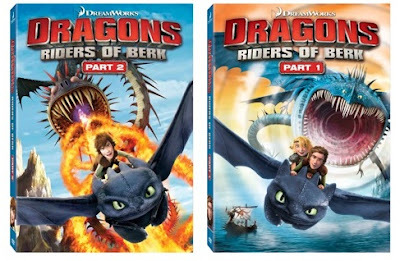 How to Train Your Dragon is one of my favorite kids' series. It's one of the few book series my son really enjoys. We all loved the movie, and we can't wait for How To Train Your Dragon 2 to be released in 2014. 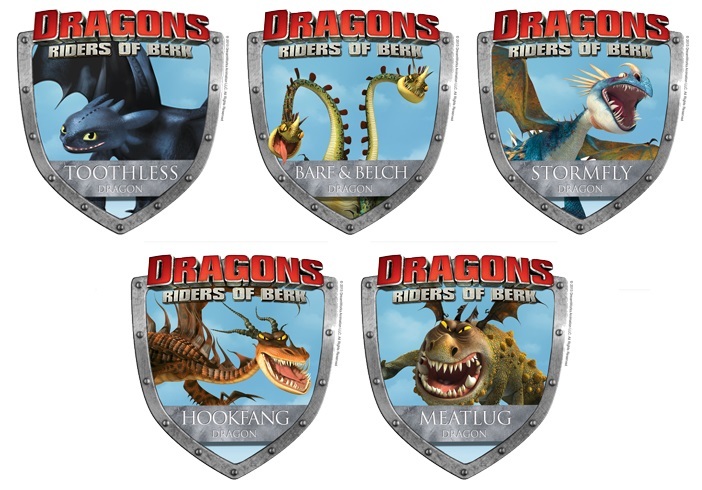 Luckily, we can still get our fill of Hiccup and Toothless through the TV series Dragons: Riders of Berk. It airs on Cartoon Network; I've watched a few episodes with the kids and have enjoyed them immensely. Even though the series doesn't really follow the sequence of events in the the book series (the movie is also very different from the book series; I wonder what the sequel will be like! ), it does introduce characters in the book series like Alvin and the Outcasts. In fact, the only reason we don't watch more episodes is that we keep forget to record the episodes -- so it's good to know that Dragons: Riders of Berk is now available on DVD in a 2-part series. Each DVD has about a dozen episodes. Whether you're a fan of the movie, the books or the TV series, you're going to want to check these out! Disclosure: I did not receive a sample or monetary compensation for this post. . The views and opinions expressed here are my own. The first day of school is almost here, and this year I've got a big role to play -- I'm going to be co-President of my sons' elementary school PTA! After 7 years at this school, I wanted to help my kids' wonderful teachers in a meaningful way and help ensure they have everything they need to do the most important job in the world -- educating our future leaders and citizens. Challenging as the PTA president job is, I know I'm lucky. I have a wonderful co-president and friend who is going to be with me the whole way. 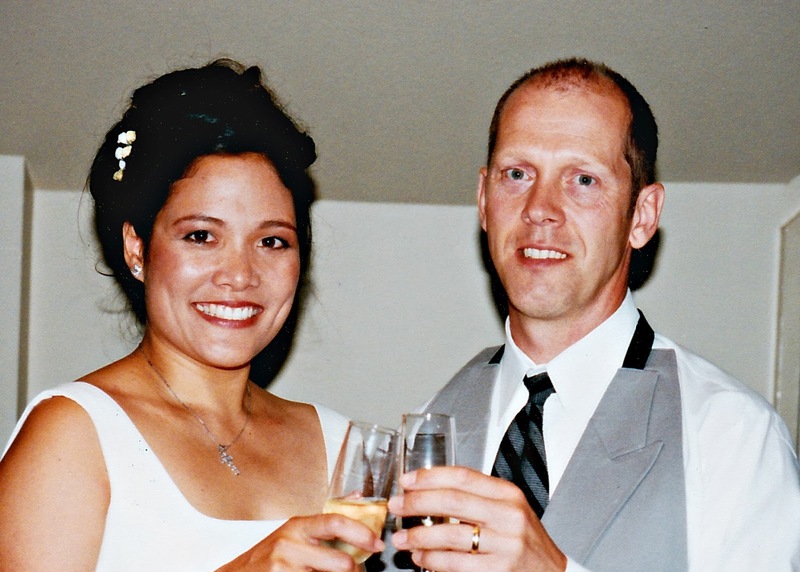 I have a supportive husband and a part-time job that gives me flexible hours. Most of all, we are lucky to have a community of parents who have the time, money and passion to devote to making our school the best it can be. Sadly, not all communities are like ours, and through no fault of their own. It's just an economic reality. The truth is that many kids across the country who are starting school without the school supplies,the staff, or the enrichment programs, that help make their learning experience a success. That's why afterschool programs like the Boys & Girls Clubs of America (BGCA) are so important. They keep kids off the streets and give them a place to gather with friends and engage in activities that keep them motivated and prepared to succeed in school. I can't be join the PTA of every school district across the country, and I wouldn't even know which schools to donate to... but there's an easy, meaningful way to help the BGCA continue their mission -- just shop at JC Penney, round up your purchase to the nearest dollar, and JC Penney will donate your change to the BGCA. 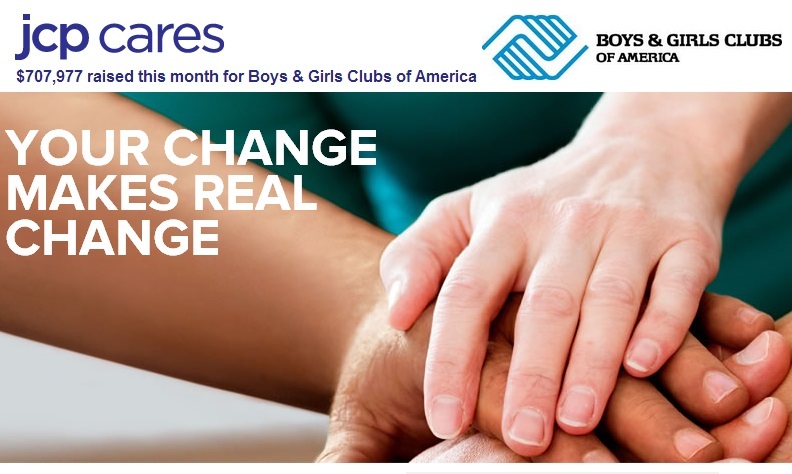 That's right, the Boys & Girls Clubs of America is JC Penney's JCP Cares partner of the month for July. All month long they are inviting their customers to round up their purchase amounts to benefit the BGCA. It's just a small amount of change -- less than a dollar! -- but it really adds up. Last year, JC Pennney was able to raise and donate over one million dollars to the BGCA, and this year they have already raised over $700,000! Those donations fund Club access grants and help promote programs like Tools for Back to School, an initiative that provides kids with the tools they need to achieve academic success. For more information about the BGCA, their mission, their partnership with JC Penney and how you can help, go to: www.greatfutures.org/backtoschool. Disclosure: Thank you to the Boys & Girls Club of America and Mom Central Consulting for selecting me to be a BGCA Back-to-School Ambassador! As a Back-to-School Ambassador, I am participating in a campaign on behalf of Mom Central Consulting for Boys & Girls Clubs of America, and I will be receiving a promotional item as a thank you for participating. The views and opinions expressed here are my own. Yup, it's a car that looks like a boat! Or is it a boat that looks like a car? 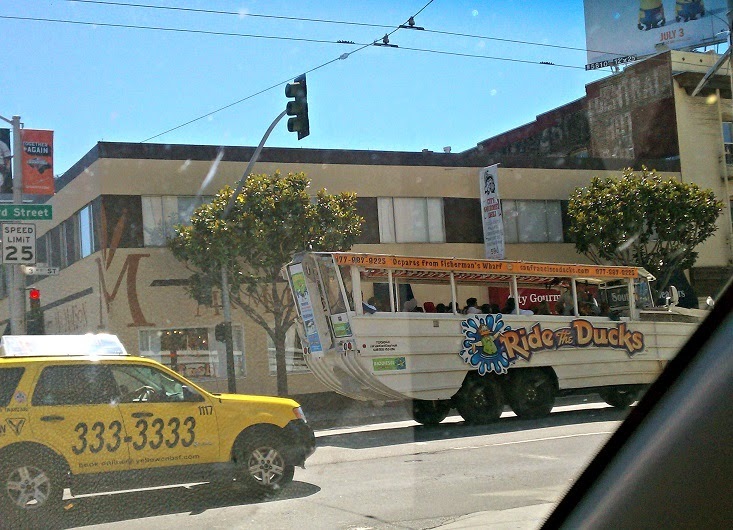 Take part in a Ride the Ducks tour of San Francisco and decide for yourself! Ride the Ducks graciously offered me some tour tickets, so I seized the opportunity to give my kids a crash course in San Francisco history and culture. I mean, they've lived all their life in the Bay Area so they ought to learn something about it, right?! Besides, I figured that even if the tour guide bored them to tears, the novelty of riding on a tour vehicle that went on land and water would be entertaining enough. No other tour draws as much attention from passers-by. We certainly felt like celebrities during our tour! All Ride the Ducks tours take place in an amphibious vehicle known as a DUKW. DUKWs were originally designed during World War II, for transporting goods and troops over land and water and for use approaching and crossing beaches in amphibious attacks. The name stands for "Designed in 1942 for Utility/amphibious purposes, with front wheel drive (K), and two rear driving axles (W)". 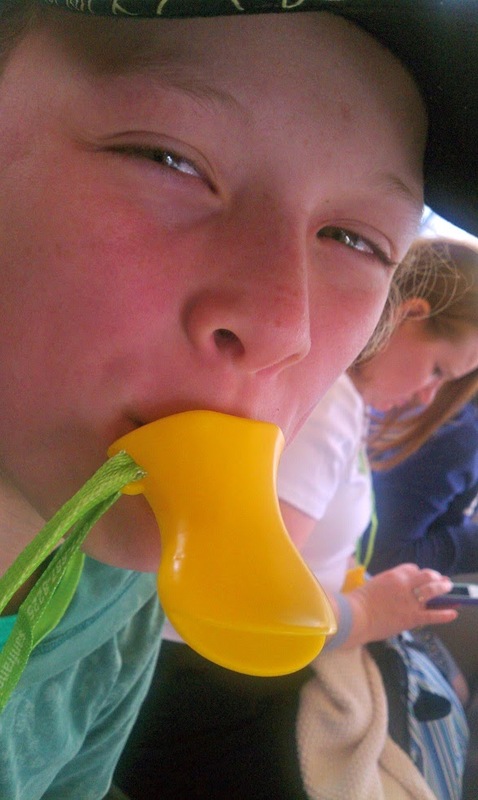 Is it any wonder people call them Ducks? 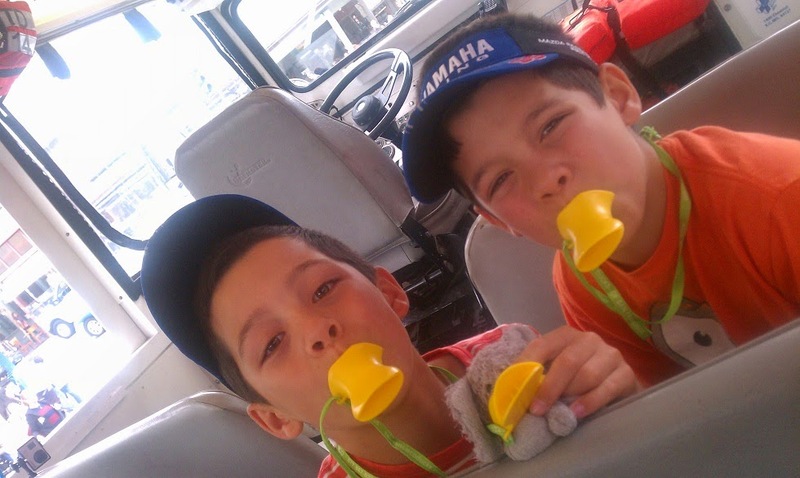 The Ducks used in the tour aren't old relics, they're custom manufactured to be safe and comfortable. The fact that they look cool and they make heads turn wherever they go is just a bonus. No other tour has a playlist. Music was piped through speakers throughout the tour, and our tour guide had the perfect song for every place we drove past -- That's Amore as we drove through North Beach, Take Me Out to the Ballgame near AT&T Park, Little China Girl in Chinatown, and so on. 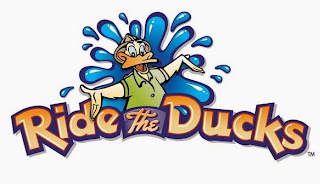 Of course, the cruise portion of the tour featured songs like Rubber Ducky, the Blue Danube and In the Navy :) The music gave the whole tour an upbeat spirit, and everyone had so much fun quacking to the beat! No other tour has a guide quite like Captain Dan. He not only fed us with interesting facts and trivia about San Francisco's major landmarks and districts, he also quacked everyone up with all his jokes. The kids even loved his corny jokes because they could blow into their quackers whenever he delivered a lame punchline. 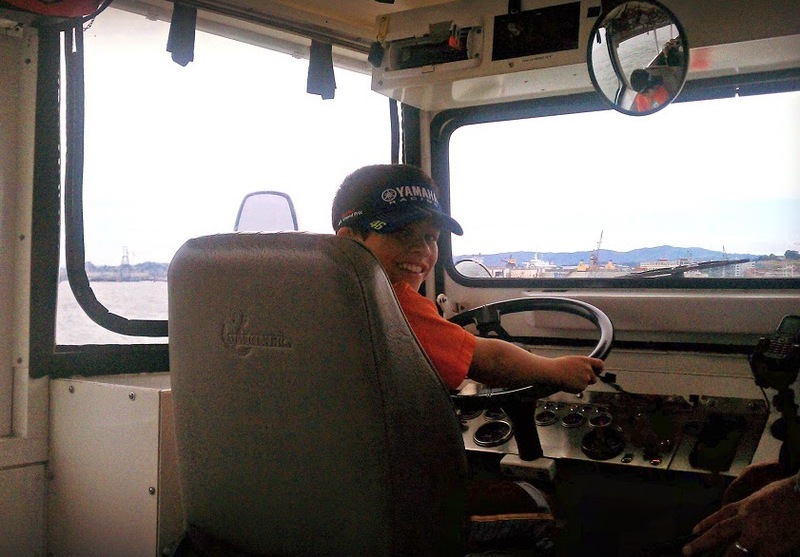 No other tour involves the tour guide driving the tour vehicle off a dock. 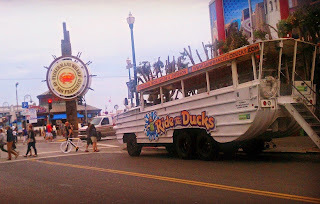 What other city tour conducts a portion of the tour on water? 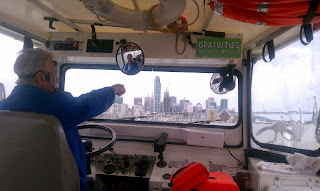 About halfway through the tour we went to the San Francisco docks and just drove into the water -- it was crazy! 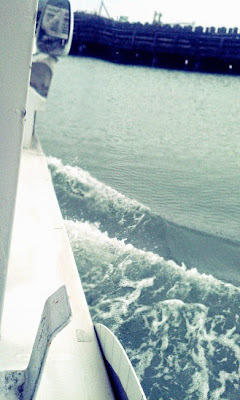 The sensation of shifting from car to boat, from the vibration on the ground to the swell of the waves, is quite novel. 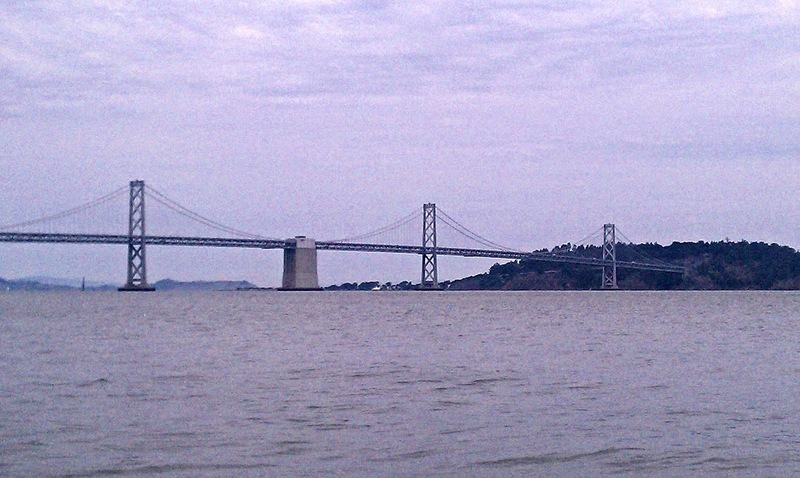 No other tour gives you this view of the San Francisco Bay Bridge. We spent about 20 minutes cruising the San Francisco Bay. The water was quite calm, not too many waves, so we didn't really have to worry about sea sickness (although by the end of the cruise portion, The Pea and I were feeling a bit nauseous, so in retrospect I would have brought our Sea Bands in my purse). Where the tour goes on the Bay depends on the current, wind and waves. For the most part, we stuck to the harbor area between AT&T baseball park and the Bay Bridge, which isn't the most picturesque part of the Bay, but hey, safety first right? 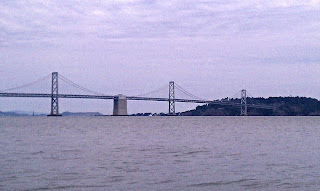 And we were treated to some great views of the Bay Bridge, Treasure Island and the San Francisco skyline. No other tour lets guests drive the tour bus! The tour guide (I suppose I ought to call him the captain, at least for this leg of the tour!) will let anyone come up to steer on the way back to the docks (the length of time depends on how many people want to do it). Jammy & 3Po couldn't believe that they were actually allowed to sit in the captain's chair and steer the boat. It was such a novel experience and I'm thrilled that Ride the Ducks could provide it for them. One final note: the tour is supposed to last 90 minutes but ended up being closer to 2 hours due to traffic. If you book a tour, I strongly suggest booking a morning tour to avoid traffic since the streets of San Francisco can get clogged up during rush hour! Don't forget that other special events like Market Day at the Ferry Building (Tuesdays) and any San Francisco Giants baseball game (which are on the tour's path) can drastically affect traffic. If you're planning to tour San Francisco -- or if you're a Bay Area native (like we are!) and want to rediscover your local habitat -- I highly recommend a Ride the Ducks tour. 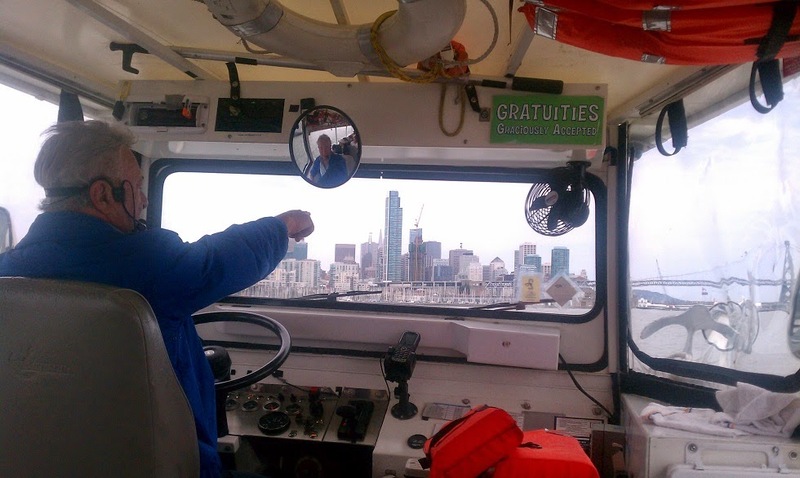 There's no other San Francisco tour out there that literally takes you on a tour of the City By The Bay, both through the City and on the Bay?! Disclosure: I received complimentary tour tickets to facilitate my review. The views and opinions expressed here are my own. Giveaway: Win an Apple Macbook Pro!